This article is about the automobile manufacturer. For other uses, see Lamborghini (disambiguation). Automobili Lamborghini S.p.A. (Italian: [lamborˈɡiːni] ( listen)) is an Italian brand and manufacturer of luxury sports cars and SUVs based in Sant'Agata Bolognese and tractors Lamborghini Trattori in Pieve di Cento, Italy. The company is owned by the Volkswagen Group through its subsidiary Audi. Motori Marini Lamborghini produces a large V12 marine engine block for use in World Offshore Series Class 1 powerboats. A Lamborghini branded marine engine displaces approximately 8,171 cc (8.2 L) and outputs approximately 940 hp (700 kW). In the mid-1980s, Lamborghini produced a limited-production run of a 1,000 cc sports motorcycle. UK weekly newspaper Motor Cycle News reported in 1994 – when featuring an example available through an Essex motorcycle retailer – that 24 examples were produced with a Lamborghini alloy frame having adjustable steering head angle, Kawasaki GPz1000RX engine/transmission unit, Ceriani front forks and Marvic wheels. The bodywork was plastic and fully integrated with front fairing merged into fuel tank and seat cover ending in a rear tail-fairing. The motorcycles were designed by Lamborghini stylists and produced by French business Boxer Bikes. Lamborghini licenses its brand to manufacturers that produce a variety of Lamborghini-branded consumer goods including scale models, clothing, accessories, bags, electronics and laptop computers. In contrast to his rival Enzo Ferrari, Ferruccio Lamborghini had decided early on that there would be no factory-supported racing of Lamborghinis, viewing motorsport as too expensive and too draining on company resources. This was unusual for the time, as many sports car manufacturers sought to demonstrate the speed, reliability, and technical superiority through motorsport participation. Enzo Ferrari in particular was known for considering his road car business mostly a source of funding for his participation in motor racing. Ferruccio's policy led to tensions between him and his engineers, many of whom were racing enthusiasts; some had previously worked at Ferrari. When Dallara, Stanzani, and Wallace began dedicating their spare time to the development of the P400 prototype, they designed it to be a road car with racing potential, one that could win on the track and also be driven on the road by enthusiasts. When Ferruccio discovered the project, he allowed them to go ahead, seeing it as a potential marketing device for the company, while insisting that it would not be raced. The P400 went on to become the Miura. The closest the company came to building a true race car under Lamborghini's supervision were a few highly modified prototypes, including those built by factory test driver Bob Wallace, such as the Miura SV-based "Jota" and the Jarama S-based "Bob Wallace Special". 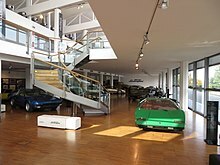 In the mid-1970s, while Lamborghini was under the management of Georges-Henri Rossetti, Lamborghini entered into an agreement with BMW to develop, then manufacture 400 cars for BMW in order to meet Group 4 homologation requirements. BMW lacked experience developing a mid-engined vehicle and believed that Lamborghini's experience in that area would make Lamborghini an ideal choice of partner. Due to Lamborghini's shaky finances, Lamborghini fell behind schedule developing the car's structure and running gear. When Lamborghini failed to deliver working prototypes on time, BMW took the program in house, finishing development without Lamborghini. BMW contracted with Baur to produce the car, which BMW named the M1, delivering the first vehicle in October 1978. In 1985, Lamborghini's British importer developed the Countach QVX, in conjunction with Spice Engineering, for the 1986 Group C championship season. One car was built, but lack of sponsorship caused it to miss the season. The QVX competed in only one race, the non-championship 1986 Southern Suns 500 km race at Kyalami in South Africa, driven by Tiff Needell. Despite the car finishing better than it started, sponsorship could once again not be found and the programme was cancelled. Lamborghini was an engine supplier in Formula One for the 1989 through 1993 Formula One seasons. It supplied engines to Larrousse (1989–1990,1992–1993), Lotus (1990), Ligier (1991), Minardi (1992), and to the Modena team in 1991. While the latter is commonly referred to as a factory team, the company saw themselves as a supplier, not a backer. The 1992 Larrousse–Lamborghini was largely uncompetitive but noteworthy in its tendency to spew oil from its exhaust system. Cars following closely behind the Larrousse were commonly coloured yellowish-brown by the end of the race. Lamborghini's best result was achieved with Larrousse at the 1990 Japanese Grand Prix, when Aguri Suzuki finished third on home soil. In late 1991, a Lamborghini Formula One motor was used in the Konrad KM-011 Group C sports car, but the car only lasted a few races before the project was canceled. The same engine, re-badged a Chrysler, Lamborghini's then-parent company, was tested by McLaren towards the end of the 1993 season, with the intent of using it during the 1994 season. Although driver Ayrton Senna was reportedly impressed with the engine's performance, McLaren pulled out of negotiations, choosing a Peugeot engine instead, and Chrysler ended the project. Two racing versions of the Diablo were built for the Diablo Supertrophy, a single-model racing series held annually from 1996 to 1999. In the first year, the model used in the series was the Diablo SVR, while the Diablo 6.0 GTR was used for the remaining three years. Lamborghini developed the Murciélago R-GT as a production racing car to compete in the FIA GT Championship, the Super GT Championship and the American Le Mans Series in 2004. The car's highest placing in any race that year was the opening round of the FIA GT Championship at Valencia, where the car entered by Reiter Engineering finished third from a fifth-place start. In 2006, during the opening round of the Super GT championship at Suzuka, a car run by the Japan Lamborghini Owners Club garnered the first victory (in class) by an R-GT. A GT3 version of the Gallardo has been developed by Reiter Engineering. A Murciélago R-GT entered by All-Inkl.com racing, driven by Christophe Bouchut and Stefan Mücke, won the opening round of the FIA GT Championship held at Zhuhai International Circuit, achieving the first major international race victory for Lamborghini. The world of bullfighting is a key part of Lamborghini's identity. In 1962, Ferruccio Lamborghini visited the Seville ranch of Don Eduardo Miura, a renowned breeder of Spanish fighting bulls. Lamborghini, a Taurus himself, was so impressed by the majestic Miura animals that he decided to adopt a raging bull as the emblem for the automaker he would open shortly. After producing two cars with alphanumeric designations, Lamborghini once again turned to the bull breeder for inspiration. Don Eduardo was filled with pride when he learned that Ferruccio had named a car for his family and their line of bulls; the fourth Miura to be produced was unveiled to him at his ranch in Seville. The automaker would continue to draw upon the bullfighting connection in future years. The Islero was named for the Miura bull that killed the famed bullfighter Manolete in 1947. Espada is the Spanish word for sword, sometimes used to refer to the bullfighter himself. The Jarama's name carried a special double meaning; though it was intended to refer only to the historic bullfighting region in Spain, Ferruccio was concerned about confusion with the also historic Jarama motor racing track. The Diablo (background) was named for a legendary bull, while the Countach (foreground) broke from the bullfighting tradition. After christening the Urraco after a bull breed, in 1974, Lamborghini broke from tradition, naming the Countach (help·info) not for a bull, but for contacc (pronounced [kʊŋˈtɑtʃ]), a Piedmontese expletive. Legend has it that stylist Nuccio Bertone uttered the word in surprise when he first saw the Countach prototype, "Project 112". The LM002 (LM for Lamborghini Militaire) sport utility vehicle and the Silhouette (named after the popular racing category of the time) were other exceptions to the tradition. The Jalpa of 1982 was named for a bull breed; Diablo, for the Duke of Veragua's ferocious bull famous for fighting an epic battle against El Chicorro in Madrid in 1869; Murciélago, the legendary bull whose life was spared by El Lagartijo for his performance in 1879; Gallardo, named for one of the five ancestral castes of the Spanish fighting bull breed; and Reventón, the bull that defeated young Mexican torero Félix Guzmán in 1943. The Estoque concept of 2008 was named for the estoc, the sword traditionally used by matadors during bullfights. Throughout its history, Lamborghini has envisioned and presented a variety of concept cars, beginning in 1963 with the very first Lamborghini prototype, the 350GTV. Other famous models include Bertone's 1967 Marzal, 1974 Bravo, and 1980 Athon, Chrysler's 1987 Portofino, the Italdesign-styled Cala from 1995, the Zagato-built Raptor from 1996. At the 2008 Paris Motor Show, Lamborghini revealed the Estoque, a four-door sedan concept. Although there had been much speculation regarding the Estoque's eventual production, Lamborghini management has not made a decision regarding production of what might be the first four-door car to roll out of the Sant'Agata factory. At the 2010 Paris Motor Show, Lamborghini unveiled the Sesto Elemento. The concept car is made almost entirely of carbon fibre making it extremely light, with a weight of 999 kg (2,202 lb). The Sesto Elemento shares the same V10 engine found in the Lamborghini Gallardo. Lamborghini hopes to signal a shift in the company's direction from making super cars focused on top speed to producing more agile, track focused cars with the Sesto Elemento. The concept car can reach 0–62 mph (100 km/h) in 2.5 seconds and can reach a top speed of over 180 mph. At the 2012 Geneva Motor Show, Lamborghini unveiled the Aventador J – a roofless, windowless version of the Lamborghini Aventador. The Aventador J uses the same 700 hp engine and seven-speed transmission as the standard Aventador. At the 2012 Beijing Motor Show, Lamborghini unveiled the Urus SUV. This is the first SUV built by Lamborghini since the LM002. As part of the celebration of 50 years of Lamborghini, the company created the Egoista. Egoista is for one person's driving and only one Egoista is to be made. At the 2014 Paris Motor Show, Lamborghini unveiled the Asterion LPI910-4 hybrid concept car. Named after the half-man, half-bull hybrid (Minotaur) of Greek legend, it is the first hybrid Lamborghini in the history of the company. Utilizing the Huracán's 5.2 litre V10 producing 607 hp (453 kW; 615 PS), along with one electric motor mounted on the transaxle and an additional two on the front axle, developing an additional 300 hp (224 kW; 304 PS). This puts the power at a combined figure of 907 hp (676 kW; 920 PS). The 0–100 km/h (62 mph) time is claimed to be just above 3 seconds, with a claimed top speed of 185 mph (298 km/h). Automobili Lamborghini S.p.A. controls five principal subsidiaries: Ducati Motor Holding S.p.A., a manufacturer of motorcycles; Italdesign Giugiaro S.p.A., a 90.1%-owned design and prototyping firm that provides services to the entire Volkswagen Group; MML S.p.A. (Motori Marini Lamborghini), a manufacturer of marine engine blocks; and Volkswagen Group Italia S.p.A. (formerly Autogerma S.p.A.), which sells Audi and other Volkswagen Group vehicles in Italy. By sales, the most important markets in 2004 for Lamborghini's sports cars were the U.S. (41%), Germany (13%), Great Britain (9%) and Japan (8%). Prior to the launch of the Gallardo in 2003, Lamborghini produced approximately 400 vehicles per year; in 2011 Lamborghini produced 1,711 vehicles. Automóviles Lamborghini Latinoamérica S.A. de C.V. (Lamborghini Automobiles of Latin America Public Limited Company) is an authorized distributor and manufacturer of Lamborghini-branded vehicles and merchandise in Latin America and South America. In 1995, Indonesian corporation MegaTech, Lamborghini's owner at the time, entered into distribution and license agreements with Mexican businessman Jorge Antonio Fernandez Garcia. The agreements give Automóviles Lamborghini Latinoamérica S.A. de C.V. the exclusive distributorship of Lamborghini vehicles and branded merchandise in Latin America and South America. Under the agreements, Automóviles Lamborghini is also allowed to manufacture Lamborghini vehicles and market them worldwide under the Lamborghini brand. Automóviles Lamborghini has produced two rebodied versions of the Diablo called the Eros and the Coatl. In 2015, Automóviles Lamborghini transferred the IP-rights to the Coatl foundation (chamber of commerce no. 63393700) in The Netherlands in order to secure these rights and to make them more marketable. The company has announced the production of a speedboat called the Lamborghini Glamour. This two-storey museum is attached to the headquarters, and covers the history of Lamborghini cars and sport utility vehicles, showcasing a variety of modern and vintage models. The museum uses displays of cars, engines and photos to provide a history and review important milestones of Lamborghini. A museum with connections to Ferruccio's family, housing a lot of the cars and other prototypes from Ferruccio's early life. Recently moved to larger premises in Argento. ^ According to AUDI AG's 2011 Annual Financial Report, on 1 July 2011, Automobili Lamborghini S.p.A., Lamborghini AntiMarca S.p.A. and STAR Design S.R.L. were merged into Automobili Lamborghini Holding S.p.A., which was renamed Automobili Lamborghini S.p.A. (S.p.A. stands for Società per Azioni, the Italian designation for a joint stock company. S.R.L. stands for Società a Responsabilità Limitata, the Italian designation for a private limited company). ^ Volkswagen AG 2012, p. 151. ^ a b c d e "2015 Annual Financial Report" (PDF). Audi. ^ "New Lamborghini Cars". Yahoo Autos. Retrieved 16 February 2018. ^ "2018 Lamborghini Aventador S". Lamborghini. Retrieved 16 February 2018. ^ "Huracán Line up". Lamborghini. Retrieved 7 July 2016. ^ "Lamborghini sees worldwide sales doubling by 2019 after SUV launch". Retrieved 25 August 2016. ^ "Lamborghini Urus". Lamborghini. Retrieved 16 February 2018. ^ "Introducing the Class 1 Championship — The Engines". ^ "Terms and Conditions". Lamborghini Store. EPI srl. Archived from the original on 5 August 2012. Retrieved 4 August 2012. EPI srl is an official licensee of Automobili Lamborghini S.p.A.
^ "Lamborghini Miura P400 Conversion to Miura SV". www.lamborghinimiuras.com. Retrieved 19 September 2017. ^ Jolliffe & Willard 2004, p. 29. ^ Lewin 2004, pp. 119–120. ^ Mitchel 2005, p. 219. ^ "Lamborghini QVX Car Guide". Qv500.com. Archived from the original on 24 June 2009. Retrieved 30 August 2010. ^ "Lamborghini". NCE. 29 May 2012. Retrieved 19 September 2017. ^ Alan Henry (12 June 2004). "Sato shapes as the rising son". The Guardian. ^ "Lamborghini Diablo SVR". Qv500.com. Archived from the original on 2 March 2010. Retrieved 30 August 2010. ^ "Lamborghini Diablo 6.0 GTR Car Guide". Qv500.com. Archived from the original on 2 March 2010. Retrieved 30 August 2010. ^ "Lamborghini Murciélago R-GT Car Guide". Qv500.com. Archived from the original on 2 March 2010. Retrieved 30 August 2010. ^ "Lamborghini Murciélago R-GT 2004 Season". Qv500.com. Archived from the original on 23 April 2009. Retrieved 30 August 2010. ^ "Lamborghini Gallardo GT3 Car Guide". Qv500.com. Archived from the original on 10 June 2010. Retrieved 30 August 2010. ^ "FIA GT Championship Results: 2007 Round 1 – Zhuhai". Fiagt.com. Archived from the original on 3 January 2010. Retrieved 30 August 2010. ^ Lieberman, Jonny (12 September 2007). "The Baddest Bull: Lamborghini Miura Vs Countach Vs Murcielago LP640". Jalopnik. Gawker Media. Archived from the original on 5 August 2012. Retrieved 4 August 2012. ^ a b Sackey 2008, p. 15. ^ Jolliffe & Willard 2004, p. 31. ^ Jolliffe & Willard 2004, p. 43. ^ a b "Countach LP500". Lamborghiniregistry.com. Archived from the original on 12 November 2004. Retrieved 30 August 2010. ^ Lawrence 1996, p. 183. ^ Jolliffe & Willard 2004, p. 90. ^ Mark Smeyers (2006). "Diablo" (PDF). lambocars.com. Retrieved 24 May 2010. ^ "Lamborghini Diablo 6.0VT". Classicandperformancecar.com. 30 March 2009. Retrieved 16 August 2009. ^ "Gallardo – The Name". Lamborghiniregistry.com. 22 November 2003. Archived from the original on 14 March 2008. Retrieved 21 January 2010. ^ Stahl, Andreas (1 October 2008). "Edmunds Inside Line – Lamborghini Estoque Concept First Look". Edmunds. Archived from the original on 21 March 2009. ^ "Lambo plans: Espada, Miura out, SUV in". AutoWeek. 19 October 2006. ^ "Secret new Lambo revealed". Top Gear. Retrieved 30 August 2010. ^ "Edmunds Inside Line – The Radical Lamborghini Sedan From the Paris Auto Show". Edmunds.com. 30 September 2008. Archived from the original on 21 March 2009. Retrieved 30 August 2010. ^ "Edmunds Inside Line – IL Exclusive: No Green Light – Yet – for Lamborghini Estoque". Edmunds.com. 23 March 2009. Archived from the original on 27 March 2009. Retrieved 30 August 2010. ^ "Paris 2010: Lamborghini Sesto Elemento". Top Gear. 30 September 2010. Retrieved 30 September 2010. ^ "Lamborghini Aventador J Blends Exotic, Superbike". Automoblog.net. 6 March 2012. Retrieved 8 March 2012. ^ "Lamborghini Egoista Concept". thecarwallpapers.com. 16 May 2013. Retrieved 17 May 2013. ^ Barlow, Jason (1 October 2014). "It's the 907bhp Lambo Asterion Hybrid". topgear.com. Retrieved 1 October 2014. ^ a b AUDI AG 2011a, p. 62. ^ AUDI AG 2012a, p. 24. ^ AUDI AG 2012, p. 152. ^ Jolliffe & Willard 2004, p. 40. ^ a b c d "Automobili Lamborghini Holding S.p.A. Company History". Retrieved 13 August 2009. ^ "Lamborghini Reports Record Figures". carpages.co.uk. 21 February 2004. Archived from the original on 3 August 2012. Retrieved 3 August 2012. In 1996, Automobili Lamborghini sold a total of 211 cars worldwide. ^ Volkswagen AG 2000, p. 50. ^ Volkswagen AG 2001, p. 23. ^ Volkswagen AG 2002, p. 24. ^ Audi AG 2003, p. 3. ^ a b Audi AG 2004, p. 5. ^ Audi AG 2006, p. 3. ^ Audi AG 2007, p. 4. ^ Audi AG 2008, p. 4. ^ Audi AG 2009, p. 4. ^ Audi AG 2010, p. 4. ^ Audi AG 2011, p. 151. ^ Audi AG 2012, p. 154. ^ "fy2012". Archived from the original on 4 October 2013. ^ "Lamborghini increases worldwide sales for the third year in a row to 2,121 cars delivered to customers". Volkswagen AG. 13 January 2014. Archived from the original on 31 October 2014. Retrieved 12 June 2014. ^ "Record Year for Automobili Lamborghini: Deliveries increased to 2,530 units in 2014". Lamborghini. 12 January 2015. Archived from the original on 15 January 2015. Retrieved 12 January 2015. ^ "Record Year for Automobili Lamborghini: Deliveries increased to 2,530 units in 2014". Lamborghini. 3 March 2016. Archived from the original on 24 July 2016. Retrieved 11 July 2016. ^ "Volkswagen Group deliveries". 24 February 2017. Retrieved 8 November 2017. ^ "Volkswagen Group deliveries". 10 October 2018. Retrieved 10 October 2018. ^ "Volkswagen Group deliveries". 8 February 2019. Retrieved 8 February 2019. ^ a b Automóviles Lamborghini Latinoamérica S.A. de C.V 1995. ^ "Sitio Oficial". Lamborghini Latinoamerica. Retrieved 3 March 2017. DeMatio, Joe (May 2003). "Lamborghini's Big Four-O". Automobile. Ann Arbor, Michigan: Source Interlink Media. ISSN 0894-3583. Archived from the original on 11 August 2012. Retrieved 10 August 2012. Henshaw, Peter (5 August 2002). Illustrated Directory of Tractors (Paperback ed.). London, England: Salamander Books. ISBN 978-0-7603-1342-8. Retrieved 31 July 2012. Holusha, John (24 April 1987). "Lamborghini Goes to Chrylser". The New York Times. New York City, New York: The New York Times Company. ISSN 0362-4331. Archived from the original on 12 August 2012. Retrieved 11 August 2012. Ireson, Nelson (12 February 2010). "Lamborghini Builds 4,000th Murcielago". MotorAuthority. High Gear Media. Archived from the original on 13 August 2012. Retrieved 12 August 2012. Jolliffe, David; Willard, Tony (19 September 2004). Lamborghini: Forty Years (Hardcover ed.). St. Paul, Minnesota: Motorbooks International. doi:10.1007/b62130. ISBN 978-0-7603-1945-1. Retrieved 3 August 2012. Lawrence, Mike (7 October 1996) . A to Z of Sports Cars, 1945–1990: The Encyclopaedic Guide to More Than 850 Marques and Thousands of Models (Paperback ed.). St. Paul, Minnesota: MBI Publishing Company. ISBN 978-1-870979-81-8. Retrieved 5 August 2012. Lewin, Tony (25 December 2004). The Complete Book of BMW: Every Model Since 1950 (Hardcover ed.). St. Paul, Minnesota: Motorbooks International. ISBN 978-0-7603-1951-2. Retrieved 2 August 2012. Lyons, Pete; The Auto Editors of Consumer Guide (9 June 1988). The Complete Book of Lamborghini (Hardcover ed.). Woodstock, New York: Beekman House. ISBN 0-854-29735-9. Mitchel, Doug (2006) [2005-10-20]. Collins, Tom (ed.). Supercars Field Guide (Paperback ed.). Iola, Wisconsin: KP Books. ISBN 978-0-89689-227-9. Retrieved 3 August 2012. Neher, Jacques (9 February 1994). "Toy or Supercar for Asia?". The New York Times. New York City, New York: The New York Times Company. ISSN 0362-4331. Archived from the original on 12 August 2012. Retrieved 11 August 2012. Sackey, Joe (15 November 2008). The Lamborghini Miura Bible (Hardcover ed.). Dorchester, England: Veloce Publishing. ISBN 978-1-84584-196-6. Retrieved 5 August 2012. Welsh, Jonathan (5 November 2010). "Lamborghini Marks The End Of Its Murcielago Supercar". The Wall Street Journal. New York City, New York: Dow Jones & Company, Inc. ISSN 0099-9660. Archived from the original on 13 August 2012. Retrieved 12 August 2012. Winterbottom, Jo (10 June 2009). "Lamborghini sees no recovery until 2011". New York City, New York: Thomson Reuters Corporation. Reuters. Archived from the original on 13 August 2012. Retrieved 12 August 2012. Wood, Jonathan (23 February 1993). "Obituary: Ferruccio Lamborghini". The Independent. London, England: independent.co.uk. ISSN 0951-9467. Archived from the original on 5 August 2012. Retrieved 4 August 2012. Woodyard, Chris (17 December 2010). "Lamborghini launches its 4,000 series Murcielago". USA Today. New York City, New York: Gannett Co. Inc. ISSN 0734-7456. Archived from the original on 13 August 2012. Retrieved 12 August 2012. Filippo Perini ci racconta il design della Lamborghini Aventador [Filippo Perini discusses the design of the Lamborghini Aventador] (Streaming video) (YouTube) (in Italian). Rome, Italy: Edimotive S.r.l. 28 April 2011. Retrieved 14 August 2012. "Lamborghini". Museo Storico Gruppo SAME Deutz-Fahr. Gruppo SAME Deutz-Fahr. 2012. Archived from the original on 5 August 2012. Retrieved 4 August 2012. "Lamborghini Latinoamérica quiere radicarse en Santiago del Estero" [Lamborghini Latin America wants to settle in Santiago del Estero]. La Gaceta (in Spanish). San Miguel de Tucumán, Argentina: La Gaceta. 11 December 2010. Archived from the original on 3 August 2012. Retrieved 18 December 2010. "Principales cláusulas de los contratos con USA e Italia" [Main Contract Terms between USA and Italy] (JPG). lamborghini-latinoamerica.com (in Spanish). Automóviles Lamborghini Latinoamérica S.A. de C.V. 5 August 1995. Archived from the original on 3 August 2012. Retrieved 2 August 2012. "Audi 2010 Annual Report" (PDF). AUDI AG. 9 March 2011. Archived (PDF) from the original on 3 August 2012. Retrieved 2 August 2012. "Audi 2011 Annual Report" (PDF). AUDI AG. 1 March 2012. Retrieved 10 August 2012. "Audi 2011 Annual Financial Report" (PDF). AUDI AG. 17 February 2012. Retrieved 30 July 2012. "Audi Facts and Figures 2002" (PDF). AUDI AG. 2003. Archived from the original (PDF) on 2 August 2012. Retrieved 2 August 2012. "Audi Facts and Figures 2004" (PDF). AUDI AG. 2004. Archived (PDF) from the original on 3 August 2012. Retrieved 2 August 2012. "Audi Facts and Figures 2005" (PDF). AUDI AG. 2006. Archived (PDF) from the original on 3 August 2012. Retrieved 2 August 2012. "Audi Facts and Figures 2006" (PDF). AUDI AG. 2007. Archived (PDF) from the original on 3 August 2012. Retrieved 2 August 2012. "Audi Facts and Figures 2007" (PDF). AUDI AG. 2008. Archived (PDF) from the original on 3 August 2012. Retrieved 2 August 2012. "Audi Facts and Figures 2008" (PDF). AUDI AG. 2009. Archived (PDF) from the original on 3 August 2012. Retrieved 2 August 2012. "Audi in Fakten und Zahlen 2009" [Audi Facts and Figures 2009] (PDF) (in German). AUDI AG. 2010. Archived (PDF) from the original on 3 August 2012. Retrieved 2 August 2012. "Audi in Fakten und Zahlen 2010" [Audi Facts and Figures 2010] (PDF) (in German). AUDI AG. 2011. Archived (PDF) from the original on 11 August 2012. Retrieved 10 August 2012. "Audi in Fakten und Zahlen 2011" [Audi Facts and Figures 2011] (PDF) (in German). AUDI AG. 2012. Archived (PDF) from the original on 11 August 2012. Retrieved 10 August 2012. "Interim Financial Report 2012" (PDF). AUDI AG. 23 July 2012. Archived from the original (PDF) on 2 August 2012. Retrieved 2 August 2012. "Shareholdings in accordance with sections 285 and 313 of the Handelsgesetzbuch (HGB – German Commercial Code) for Volkswagen AG and Volkswagen Group as of December 31, 2010" (PDF). VOLKSWAGEN AG. 10 March 2011. Archived from the original (PDF) on 15 August 2012. Retrieved 15 August 2012. "Statement of Interests Pursuant to Sections 285 and 313 of the German Commercial Code" (PDF). AUDI AG. 17 February 2011. Archived from the original (PDF) on 30 July 2012. Retrieved 30 July 2012. "VOLKSWAGEN AG Annual Report 1999" (PDF). VOLKSWAGEN AG. 17 March 2000. ISSN 0933-7504. Archived from the original (PDF) on 3 August 2012. Retrieved 30 July 2012. "VOLKSWAGEN AG Annual Report 2000" (PDF). VOLKSWAGEN AG. 16 March 2001. ISSN 0933-7504. Archived from the original (PDF) on 3 August 2012. Retrieved 30 July 2012. "VOLKSWAGEN AG Annual Report 2001" (PDF). VOLKSWAGEN AG. 1 March 2002. ISSN 0933-7504. Archived from the original (PDF) on 3 August 2012. Retrieved 30 July 2012. 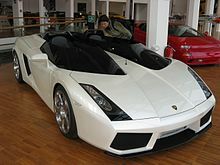 Wikimedia Commons has media related to Lamborghini. This page was last edited on 11 April 2019, at 23:19 (UTC).